Tony Bailey Photography Cincinnati Cyclones forward Shawn O'Donnell waits for a pass to come to him from Alex Kile, as Fort Wayne's Bobby Shea, right, and Gabriel Desjardins, left, defend at U.S. Bank Arena on Saturday night in Cincinnati. Tony Bailey Photography Komets defensmen Curtis Leonard, left, and Bobby Shea, right, battle with Cincinnati Cyclones Justin Vaive, front right, and Justin Danforth, for the puck at U.S. Bank Arena on Saturday night in Cincinnati. Tony Bailey Photgraphy Komets forward Shawn Szydlowski fires a shot toward Cincinnati goaltender Jonas Johansson at. U.S. Bank Arena on Saturday night. Chris Leone, No. 4, and Shawn O'Donnell, No. 16, look to block the shot for the Cyclones. 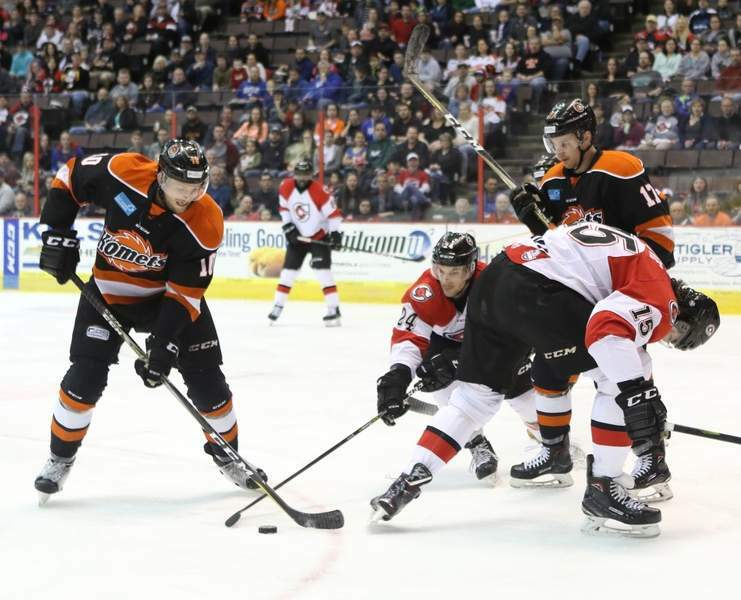 CINCINNATI – The Komets had many chances to get breathing room in the third period at U.S. Bank Arena, but they were thwarted at every turn. They didn’t need anything more than the one-goal lead they had, it turned out. Goaltender Michael Houser had the save of the season, sliding to his left to glove Jesse Schultz’s shot at what looked like a wide-open net in the final minute of a 2-1 victory. Houser finished with 36 saves, and the Komets have a 3-1 lead in the best-of-7 Central Division semifinals than continue at 3 p.m. Sunday. If the Komets win, they advance to meet the Toledo Walleye. Coming off Thursday’s 7-6 overtime victory, which was cemented by Arvin Atwal’s 30-foot shot, the Cyclones bolstered their lineup even more with the addition of Justin Danforth. The ECHL’s Rookie of the Year and fourth-place finisher in the MVP voting – Fort Wayne’s Shawn Szydlowski was the winner – had been with Rochester of the higher-level American Hockey League. The Komets had eight of the first nine shots in a scoreless first period that saw the first three power plays go in favor of the Cyclones. Both goaltenders came up with big stops, too as Jonas Johansson, who totaled 36 saves, thwarted Gabriel Desjardins from point-blank range and Houser stopped Shawn O’Donnell on a breakaway. The Komets’ first power play – Alex Kile was serving a slashing penalty – resulted in a 1-0 Fort Wayne lead because Artur Tyanulin circled the offensive zone and flicked a shot from the top of the right circle that caromed off the inside of the left goalpost and in 1:31 into the second period. The Cyclones kept battling and a 3-on-1 rush at 8:35 ended with Houser covering an O’Donnell shot. A Houser breakout pass set up Desjardins and Phelix Martineau for a give-and-go that ended with a Desjardins one-timer goal for a 2-0 lead at 13:14. But a turnover by Fort Wayne’s Kevin McKernan set up the Cyclones for a Winston Day Chief goal at 16:51 when he redirected an Atwal shot from the blue line. 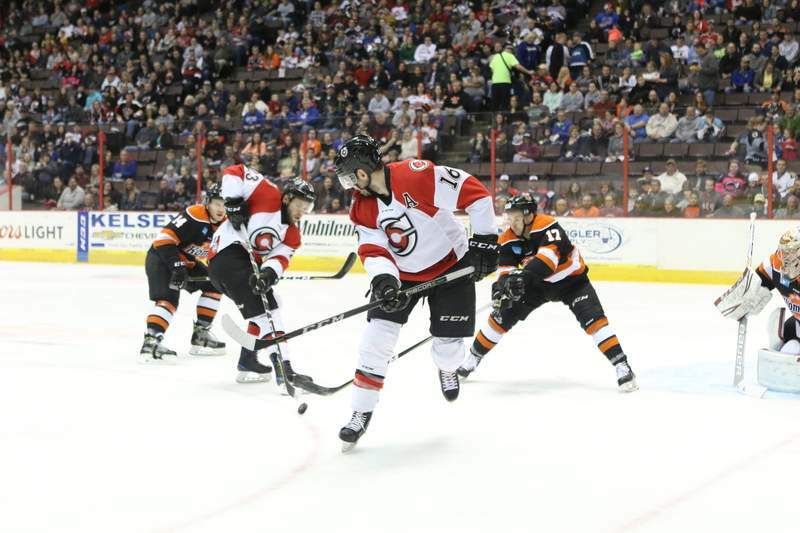 The Komets looked to have regained some breathing room with a Jamie Schaafsma goal 2:20 into the third period but the referees, Alex Normandin and Jonathan Sitarski, waved it off because they determined he redirected a Martineau shot by using a high stick. Another great chance for the Komets saw a 2-on-1 rush end with a Szydlowski shot negated by an Atwal sliding block at 14:42. 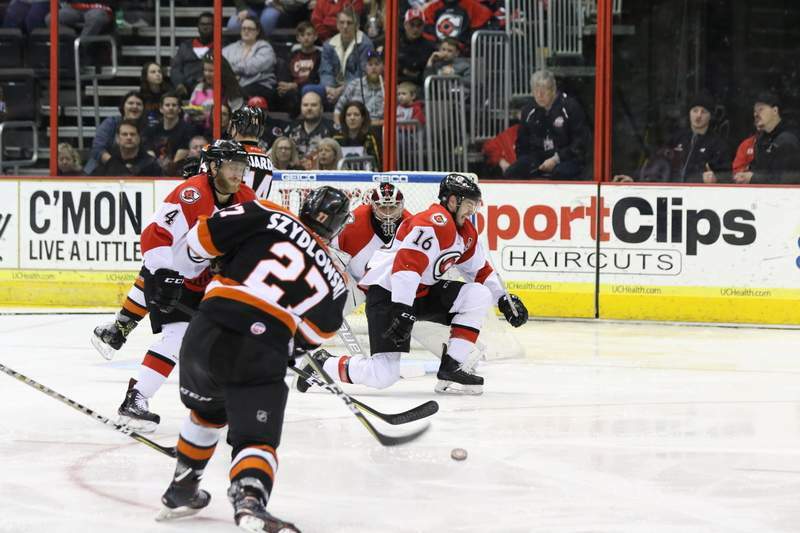 When Tyanulin was penalized for hooking at 17:23 – the hundreds of Komets fans believed it was a dive by Danforth – it gave the Cyclones yet another great chance but Houser was there. Notes: Defenseman Curtis Leonard made his playoff debut for the Komets, who scratched Marco Roy, Daniel Maggio, Justin Hodgman and Ryan Culkin. … Trevor Cheek and Zac Larraza remained with Tucson of the higher-level American Hockey League.